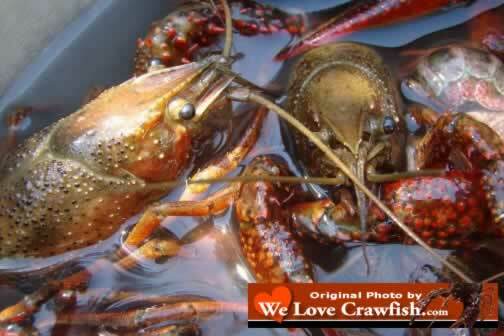 Some folks call 'em crayfish, crawdads, or mudbugs, but here in Louisiana they are simply CRAWFISH, whether they are basin crawfish, spillway crawfish, or pond crawfish. We've been catching crawfish all our life, and love the Louisiana and Gulf Coast tradition of a long, leisurely crawfish boil in spring! We are excited about the 2019 crawfish season which began in late December of 2018! It's February of 2019, and time for another Super Bowl. One tradition we have annually on that day is enjoying a family gathering, hoping we win a square on the football board, and dining on seafood gumbo. 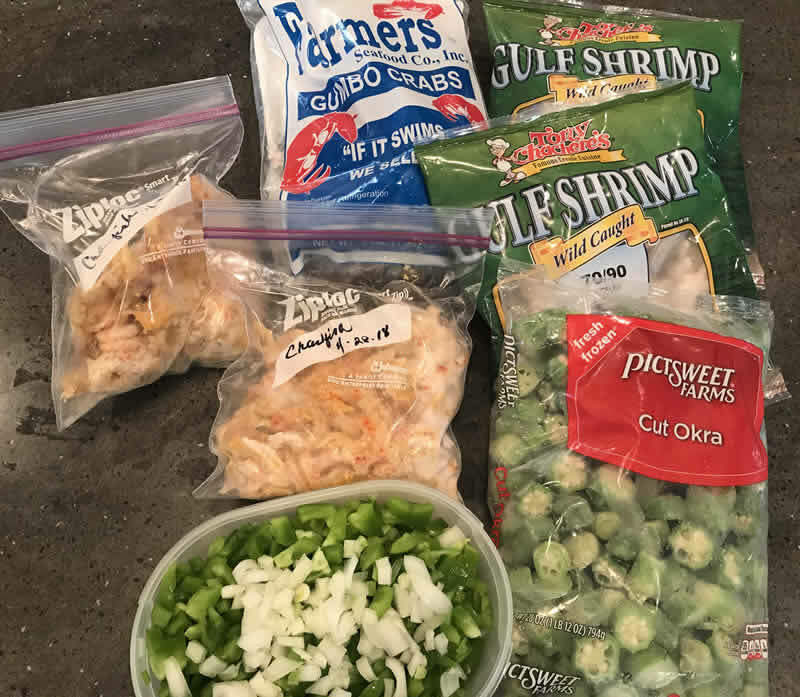 First the ingredients ... we begin with Louisiana crawfish tails from April of 2018, hand-peeled at a boil and frozen until now. And then Tony Chachere's Gulf Shrimp ... PRODUCT of USA! We carefully shop for and purchase native shrimp, and refuse to buy imported shrimp. We also include Gumbo Crabs from Farmers Seafood Market in Shreveport. And of course to build texture and seasoning we add okra, and "The Trinity", seen here already cut up ... onions, peppers and celery. Often we use Savoie's Old Fashioned Dark Roux as a starter. Sometimes we also add Andouille sausage, usually from Manda's in Baton Rouge. Happy New Year to all of our website viewers, friends and followers! Check back with us soon as the 2019 crawfish season gets underway. 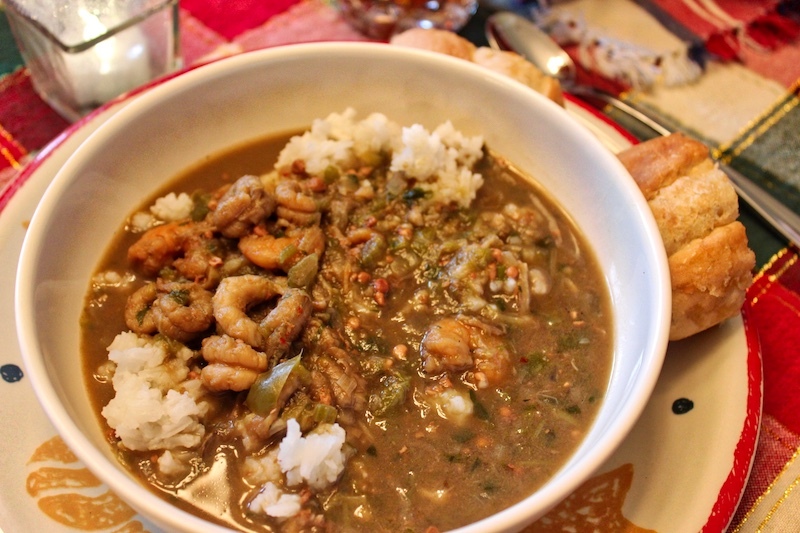 Dining on gumbo during Super Bowl at the family table ... yum! There is a great lineup of 2019 crawfish festivals in Louisiana in places like Breaux Bridge, Chalmette, Lake Charles, and Shreveport. Many exciting Texas crawfish festivals are scheduled in 2019, from Kemah to Austin, from Fredericksburg to Pearland, and all over the Lone Star State. And these days crawfish festivals are happening all across the USA, in Mississippi, Alabama and Florida ... and even New Jersey and San Diego. Let's make plans to attend as many 2019 crawfish festivals as we can! What does the weather mean for the 2019 crawfish season? Is it crawfish season yet? 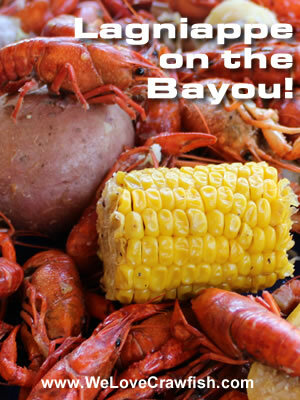 Enjoy Our Website ... And Enjoy Eating Crawfish! The biggest single days for crawfish boils are Super Bowl Sunday, Easter Sunday and Mother's Day. Actually any day is good for crawfish ... we've been known to have crawfish at Thanksgiving and Christmas! We invite you to explore our website, and learn more about where to buy crawfish, how to boil crawfish, some favorite crawfish recipes, and view our Crawfish Photo Gallery. Boiling crawfish is a Cajun tradition, an event and social gathering not to be rushed, but to be enjoyed with family and friends. Let's begin the "process"! If we don't have time to catch crawfish in the swamp, we shop at a local seafood market. And today we have the option of online ordering of live crawfish on the web. In Louisiana and the south, we celebrate the crawfish in a fun way: Festivals! Events in 2019 will encompass all the good things about Gulf Coast living: food, music and merriment! Excellent Cajun cooking abounds in Louisiana. Crawfish is a key ingredient in many Louisiana dishes such as etoufee, crawfish pie and gumbo.